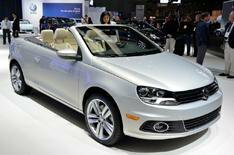 Volkswagen Eos | What Car? The all-new Volkswagen Beetle didnt manage to make it over the border from Mexico, where it will be built, to Los Angeles for the show, but Volkswagen did have a revised version of its hard-top coupe-cabriolet, the Eos. And to prevent anyone feeling short-changed, VW co-opted German supermodel Heidi Klum, now an L A resident, to get up early to help present it. The updated Eos, which will come to the UK in February, just in time for the worst of the winter weather, is a cosmetic restyling exercise rather than a re-engineered car, though there are a number of extra convenience features. The front wings, bonnet, grille, bumper and lights have been changed to bring the cars frontal look into line with the appearance of other recent new or revised VWs, and theres a new rear bumper and light unit plus different alloy wheels. The trim on the seats and dash has been upgraded. Standard equipment includes a leather multifunction steering wheel, sports seats, air conditioning and an eight-speaker hi-fi system. The five-piece metal roof includes a sunroof for days when the full top-down experience might be a bit too bracing, and the roof can be lowered remotely if you specify the optional keyless entry. The engine range remains unchanged 1.4- and 2.0-litre petrol engines delivering between 120 and 207bhp, and a 138bhp 2.0-litre turbodiesel with stop-start and brake energy recovery. The energy recovery system has been improved to give the car mildly better fuel economy now2 58.8mpg. A 3.6-litre V6 will be offered later. Prices will start at 22,800.